Breathe Life Into Your Lifestyle. ​55 Resort Apartments at Water Valley is redefining the living experience for independent adults (55 and up). 55 Resort Apartments features a variety of state-of-the-art on-site amenities including a fitness center, community kitchen and dining area, theater and multimedia room, tavern, library and more – there’s something here for everyone. With access to Water Valley’s amenities including 27 holes of golf at Pelican Lakes & Pelican Falls Golf Club, your best years are here at your new home in Windsor. A simple primary alert with 55 Resort Apartments Site. Give it a click if you like. 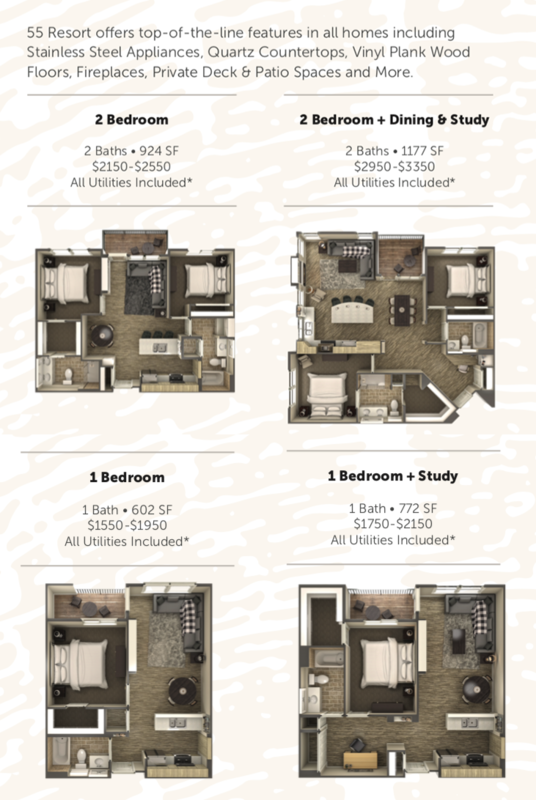 55 Resort offers top-of-the-line features in all homes including Stainless Steel Appliances, Quartz Countertops, Vinyl Plank Wood Floors, Fireplaces, Private Deck & Patio Spaces and More!